Add Conversation Service · Exploring Microservices — Game On! Where we learn how to integrate Watson Conversation service with a Swift chat room. 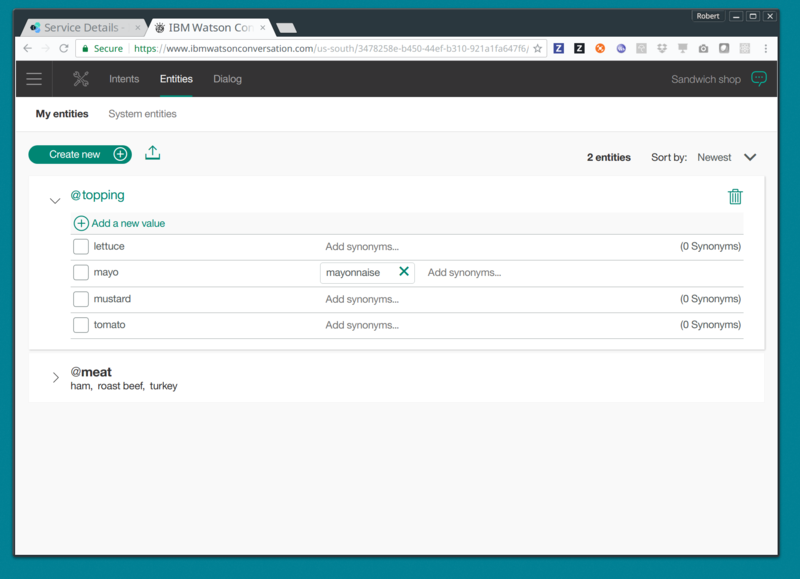 This adventure will teach you about integrating a Watson Conversation service into your Swift room by walking you through the process of creating your own Watson service in Bluemix and adding integration points to a GameOn room. You will come away having learned a little about using Watson services and there will be suggestions for how you can use this further within a room. More and more developers are demanding the use of cognitive features in their applications. That’s why IBM Watson is targeting the need by providing many services through Bluemix that can be easily integrated into applications through a REST API. There are many services available on Watson, and they can be divided into major categories such as “language”, “speech”, “vision”, and “data insights”. Some very popular services include Natural Language Understanding for recognizing the meaning behind natural language and Visual Recognition for classifying contents in images. This adventure focuses on Natural Language Understanding using Watson’s Conversation service. Because interfacing with a REST endpoint using low-level networking calls quickly becomes inefficient, there are many Watson Developer Cloud SDK’s that have been created to simplify making requests, exposing natural functions and data structures for the language. What would have taken over 500 lines of code, takes now 10. The Watson Swift SDK, previously named the iOS SDK, is now the second most used Watson SDK (after the NodeJS SDK). It had its origins, obviously, for the iOS mobile use case, but since the Swift programming language now can be used on Linux, it has opened the SDK for usage for server-side programming as well. Now you can use the same SDK you have bundled in your client application, and easily move that functionality out to the server, giving you more control over the frequency at which calls to Watson are made, have a single point for credentials for making the calls, and also can create applications where the result of the request to Watson can be shared with multiple users. In this adventure, we take an existing GameOn Swift room and integrate with a Watson Conversation service, so that the Watson bot can respond to chat messages from GameOn participants. First, you’ll need to create and configure a new Watson Conversation service. 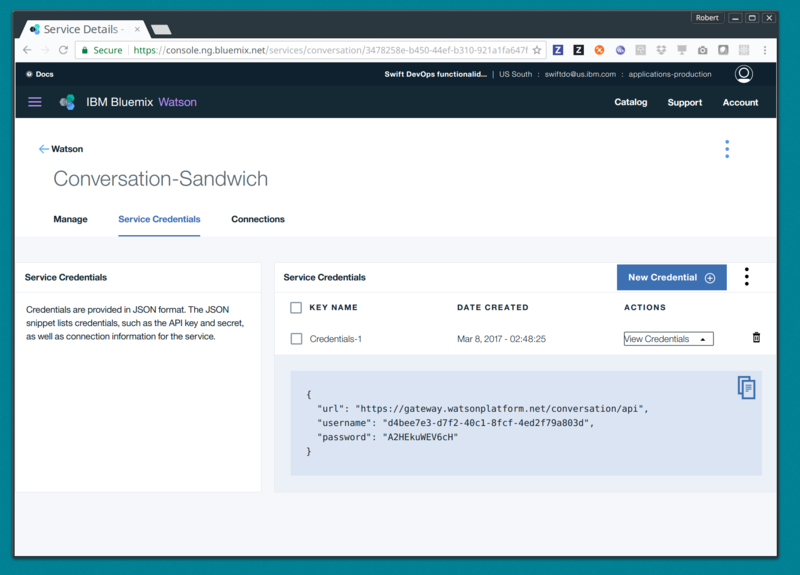 Building out a new Conversation service should only take a few minutes once you have a Bluemix account (you can get a free test account too). 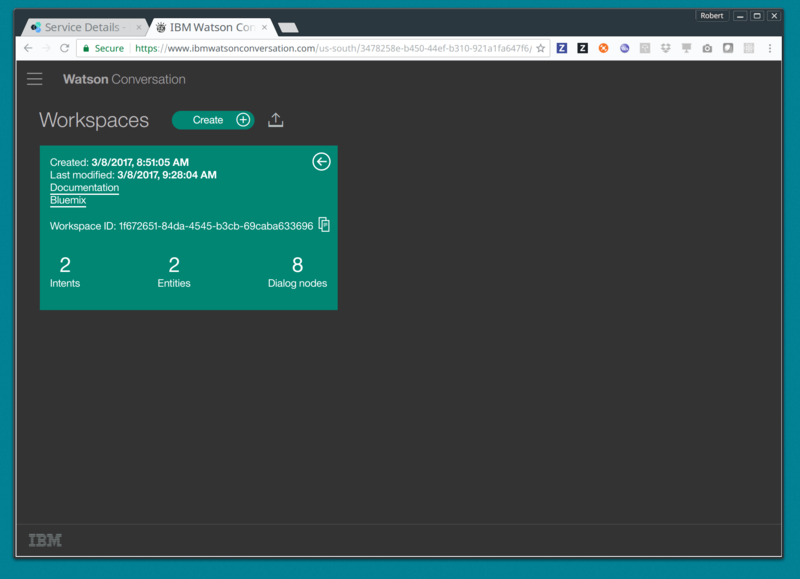 Create a new Watson Conversation service in Bluemix. You will need to sign up for a Bluemix account if you don’t have one already. Navigate to “Catalog” and search for “Conversation”, select it from the results and create a free plan. Get the credentials from your service. After your conversation service has been created, you will be able to get the username and password for the service from the “Service credentials” tab → “View credentials” dropdown. Record these now, you will need it later when we start coding your application. Create a new Workspace for your application. A workspace is the way you can express a dialog. 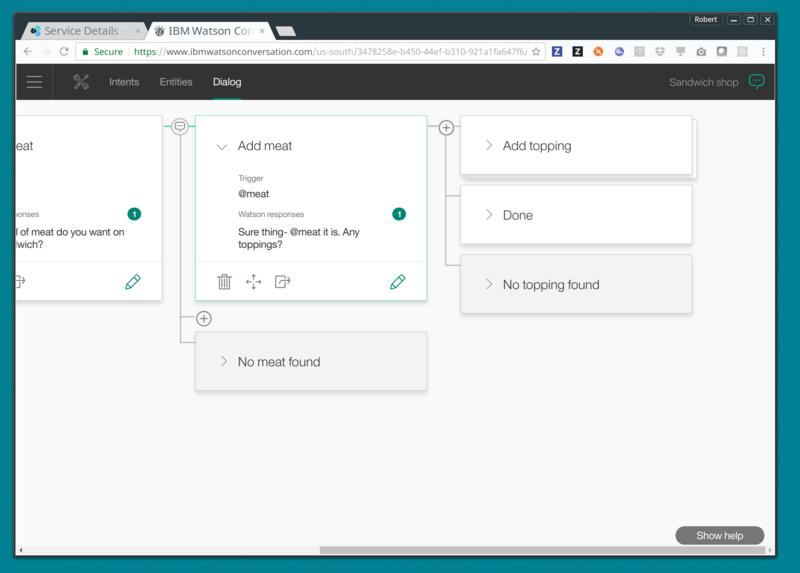 Your Watson Conversation service may contain many workspaces for all of your user flows. Intents are the ways Watson understands the user’s intent. 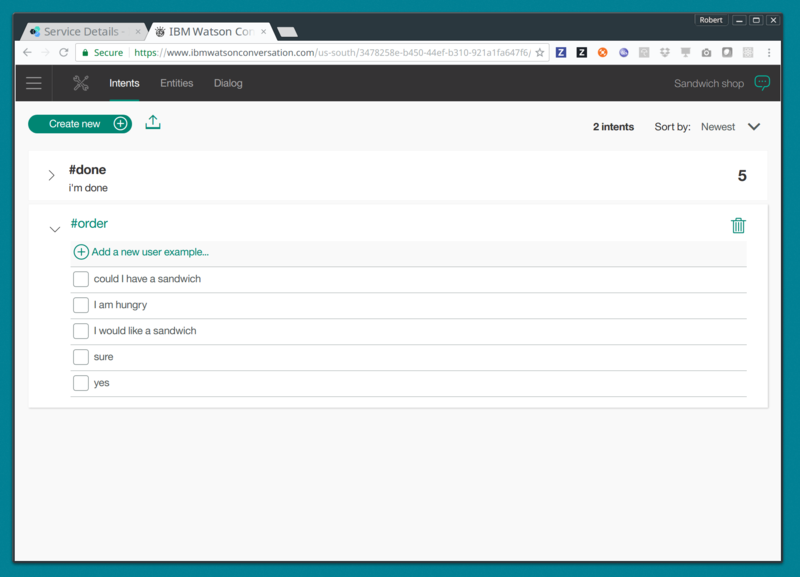 In other words, you can train the Watson Natural Language classifier with a bunch of examples of ways of expressing an intent like “ordering a sandwich”, and in the future, even though your users won’t necessarily write their requests exactly how you specified it, through training the language model Watson will select the intent if that request matched it within a certain threshold level. Entities are the specifics of information that can come in through the intents. Entities are most likely nouns that help you better service the request. For our example, we will be creating some entity types like, @toppings and @meats. You can now design your dialog with the intents and entities you created earlier. Your must create triggers that based on whether it is matched or not, will yield a response from Watson. It’s probably a good idea at this point to test your conversation and make sure it’s working properly. You can press the dialog bubble icon on the top right to start a simulation of your conversation. Before we start making modifications to your GameOn room, copy your workspace ID. Follow the menu option to workspace, select the “drawer” icon next to the workspace card and choose “view details” in order to see your workspace ID. You will need this ID later when you connect your code to this workspace. Add the Watson SDK as a dependency in your project. In Source/SwiftRoom/RoomImplementation.swift, import the Conversation service module. Set some of the settings for your service. If you recall from the prerequisites section above when setting up the Conversation service, you saved your credentials and workspace ID. You will need these values at this point. 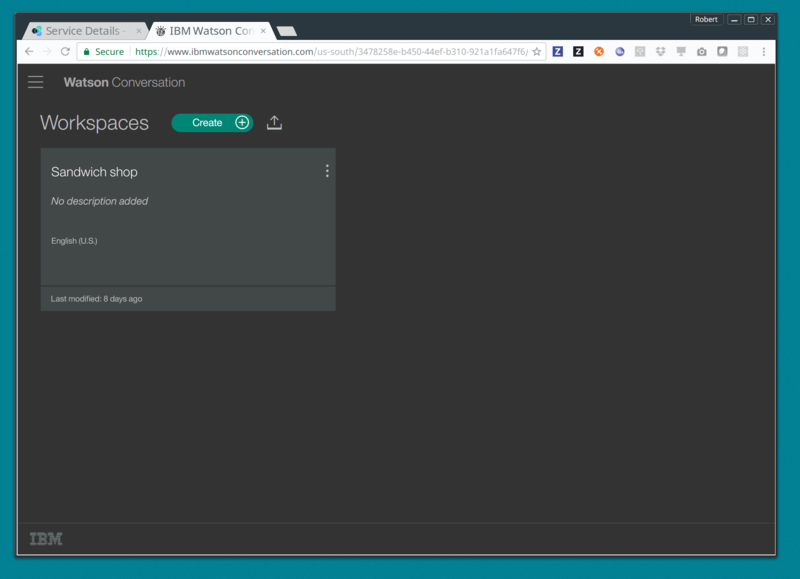 Add a Conversation service wrapper to your RoomImplementation class to connect to your Conversation workspace. The wrapper is an object you will use to send input to, and receive output from, the service. Add a Context for the conversation. A context allows the conversation to hold state. For instance, when you are finished selecting the meat on your sandwich, Watson continues the conversation with asking about toppings. Since REST calls are stateless by nature, we can hold state by keeping a state ID that is updated whenever you get a new response back. In the Swift language, a property can be initialized to nil by using optional chaining. This is done by placing a question mark (?) after the optional property. For more information on optional chaining, check out the Swift Programming Language docs. Set the context of the conversation on application start. In the handleMessage method in RoomImplementation.swift, there is a switch block on the message target. In the case of target == “room”, the message is either a command or a chat. We want to send the chat messages to the Conversation service and then send Watson’s response back to the client. Add the Watson code in the “else” block. That should be it! You can see a working sample [jkingoliver-github}[here]. cd into your working directory and compile your project. Run and test your server locally. Then access http://localhost:8080/ in your browser. Visiting this page provides a small chat window you can use to test Watson in your service directly. register your room with the game. The more the Conversation service is developed, the more interesting this adventure will be. Use your imagination! 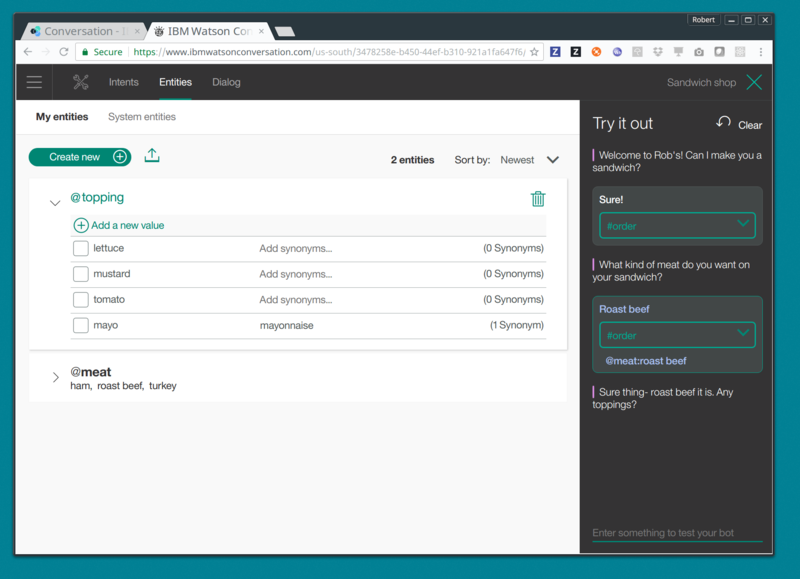 Connect additional Watson services to analyze user input, such as Tone Analyzer or Speech to Text. 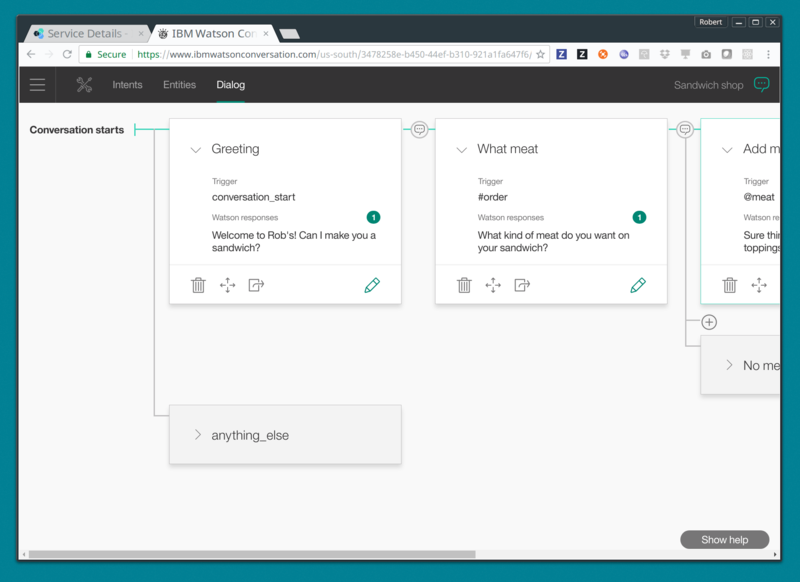 You should now have a basic understanding of Watson’s Conversation service, how to set it up in Bluemix and how to integrate it with your Swift room. We hope you enjoyed this adventure and feel inspired to explore with Watson. Persistence - Learn about persistence via a Cloudant database. This particular adventure is based on a GameOn Java room, however you can start here to pick up the basics of persistence from a Microservice perspective and how you might use a Cloudant service instance within a room. Checkout IBM Swift’s TodoList-CouchDB sample application to see how to connect your room to a Cloudant service instance in the Swift programming language.